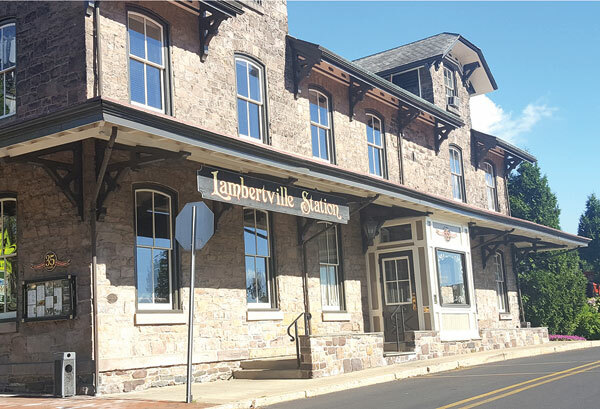 A repurposed train depot, Lambertville Station is now a historic inn and restaurant. Note: This is the first of two articles on driving destinations in New Jersey. Next issue: Atlantic City. It was just past Labor Day, but the scenery screamed summer along Route 29 in the Delaware Valley. Leaving I-95 behind just north of Philadelphia, my husband, Oggi, and I drove north through a landscape of timeless Americana: rolling green meadows punctuated with prim white farmhouses, thick maple forests that canopied the sun-dappled road, the occasional bright-red barn. All along the journey, water was a constant. The Delaware and Raritan Canal — built in the 1830s to ship freight from Pennsylvania to New York — runs along the western spine of New Jersey along the river and Route 29. From time to time, the forests gave way to shimmering water views beyond the canal — glimpses of the wide, unspoiled Delaware. We were on our way up to Lambertville, one of the prettiest towns in the region and a destination for lovers of art, antiques, and history. It turned out to be an ideal itinerary for our toddler in tow: Two-year-old Zelda is lately fascinated by bridges, and with all the streams, rivers, and canals that flow in and around Lambertville, there were plenty of spans to explore. These ranged from quaint wooden footbridges to the visually stunning New Hope-Lambertville Bridge, a steel-truss bridge built over the Delaware in 1904 to connect New Jersey with New Hope, Pa. (home to the area’s only synagogue, Reconstructionist Kehilat Hanahar, known as “the Little Shul by the River”). “That’s what comes of following Bridge Street,” my husband commented as we headed inadvertently out of state, gaping at the splendid water views. Back in Lambertville, Zelda was charmed by a vintage railroad car on the riverside tracks. 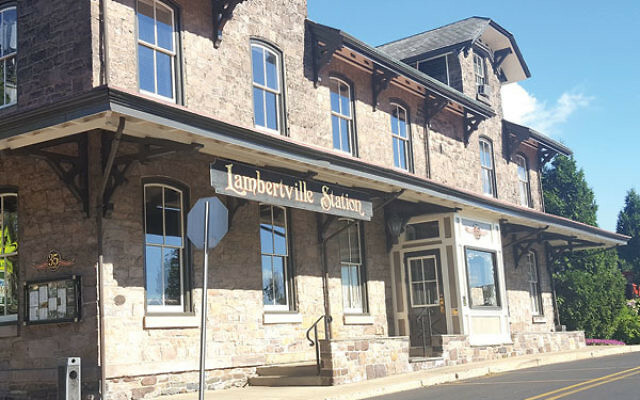 I was more impressed by the restored Lambertville Station, one of those elegant 19th-century depots from rail travel’s golden age — today restored as a historic inn and restaurant, where inviting tables overlook the canal out back. Pretty but not precious, Lambertville has been a destination since its founding in 1705, owing largely to its strategic position on the river, and later the canal and railroad. Many recent arrivals are craftspeople and artists drawn to the peaceful setting — including the town’s most famous resident, 91-year-old American-Jewish poet Gerald Stern, who was the state’s first poet laureate. American flags flutter from the federal-style stone and brick row houses along Union and Main streets, where gallery-hopping and antiquing are popular activities. But we found the liveliest shopping just south of downtown, amid racks of vintage jackets and dusty tables of vinyl, in the thrice-weekly Golden Nugget Antique and Flea Market — a browser’s paradise since the late 1960s. Leaving Lambertville, we followed the D&R as it snaked east through Trenton — an underground section is covered by roadway — and resurfaced in the countryside just outside Princeton. It’s a particularly pretty section of the canal, punctuated by dams and locks and mossy footbridges; geographically you’re in the middle of suburbia, but the sight of rowers gliding along Lake Carnegie, which runs parallel to the canal, is unchanged from a century ago. A bustling college town today, Princeton is actually one of the state’s oldest settlements. At one end of Lake Carnegie, the 18th-century stone Kingston Bridge was rebuilt after George Washington’s troops demolished the original to foil British pursuers. In this historic district — just minutes from downtown but largely hidden from view — several nearby houses and the picturesque Kingston Mill date to the 19th century. While it’s fun simply to ogle some of the gargantuan mansions that line Princeton’s residential core, the most visited home is the unassuming white colonial on Mercer Street that belonged to Albert Einstein. The Princeton University physicist, arguably Princeton’s most famous Jewish resident, lived here from the 1930s until his death in 1955; today his house is a National Historic Landmark. Fans of Einstein, math humor, and pastry should visit the week of March 14, Pi Day, when Princeton hosts a weeklong celebration of Einstein — complete with pie-eating, an Einstein look-alike contest, a 3.14-times-3.14-mile bike tour (the value of Pi, get it?) in honor of the great scientist (a famous non-driver), and other nerdy pastimes. Across the main thoroughfare of Nassau Street, an urbane mix of stylish cafes and upscale boutiques that feels thoroughly contemporary, the Princeton campus is a pleasant gateway to one of New Jersey’s prime art collections. The Princeton University Art Museum boasts a collection that would be the jewel of many a much-larger city — including major works by a number of prominent Jewish artists, including Max Ernst, Sol LeWitt, Morris Louis, Martha Rosler, and the pop artist George Segal. A still by Alfred Stieglitz was the first in the museum’s now-renowned photography department, and paintings by Amedeo Modigliani and Chaim Soutine are among the Jewish highlights of the European gallery. Those with a taste for sculpture should head south to Hamilton, a leafy town near Trenton whose chief attraction is Grounds for Sculpture, a kind of theme park for art fans on the site of the former New Jersey State Fairgrounds. The welcome center’s Van Gogh Cafe serves up macarons and frites under a “Starry Night” ceiling, while a pond-side restaurant in the park offers rustic French fare in a setting intended to replicate Monet’s retreat at Giverny. Across the park’s 42 landscaped acres are rotating exhibits of contemporary sculptures and a pretty gazebo where Zelda ate ice cream and peered at her reflection in the lotus pond. As the sun set and we drove back along the locks of the D&R, summer lingered for a handful of fishermen casting lines among the cattails. The GPS suddenly seemed irrelevant; for New Yorkers and Philadelphians, a two-centuries-old watery path remains the scenic route home.